The Chub was @SpeciesofUK from 4th to 17th November, 2013. 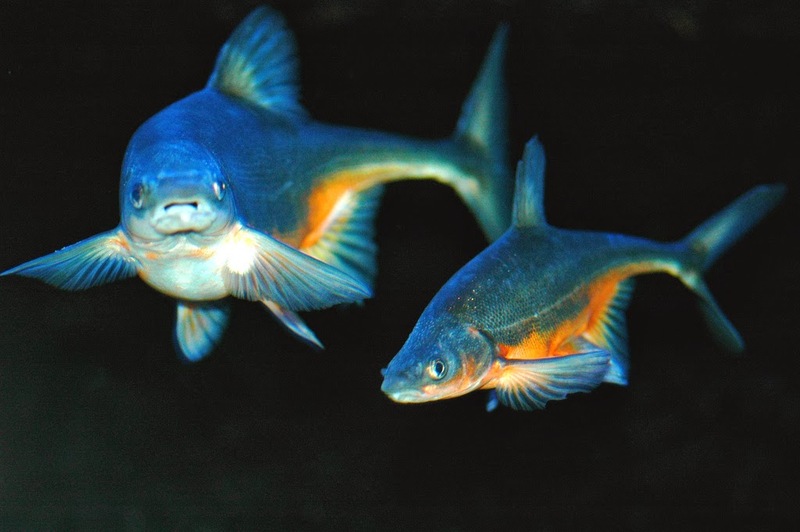 Squalius cephalus, the European Chub, or ‘chub’ for short, is a freshwater fish from the carp family. Chub are popular with UK anglers who consider them to be one of the wiliest of our fish. The chub is present across most of Europe. It is distributed from the UK in the west as far east as the Caspian Sea. It’s only absent from the far north and interestingly also from Italy and the Adriatic basin. Chub are most abundant in small rivers and large streams, but also appear along the shores of slow lowland rivers and small mountain streams. They can also be found in many large lakes, from which they undertake migrations in the spawning season to the inflowing streams. There are many other types of ‘chub’. The fish that in the UK we call the chub is a member of the Squalius genus. There are actually 46 recognised species in this genus, which taken together make up the ‘European chubs’. On top of that there are many other ray-finned fish in several other genera and families that get referred to as chubs. The name chub has been traced to Late Middle English 1400-1500 ‘chubbe’. Other than that it's not certain how the name came about. The chub is a distinctive fish. Chub have a large head with a large mouth and thick-rimmed lips. The upper lip protrudes. They are a simple dark grey or brown colour along the back running into a brass colour along the flanks. 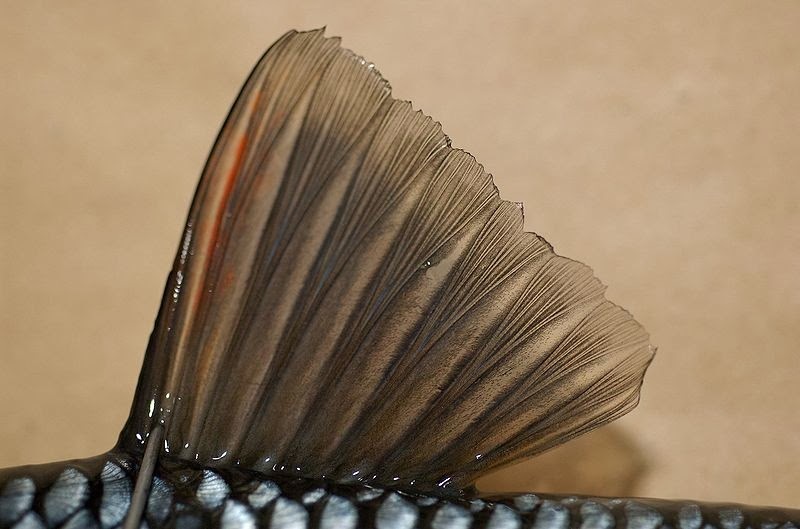 The dorsal and tail fins are dark grey and the underside fins are orange. 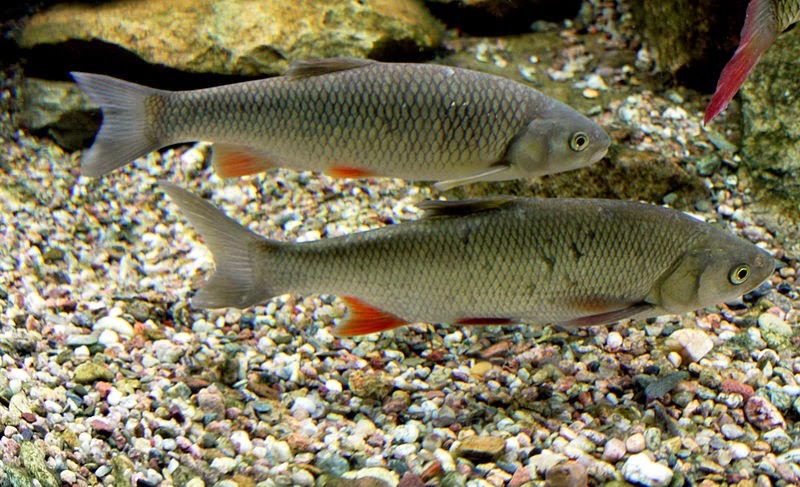 Chub look quite similar to dace, however the dorsal fins are somewhat different - chub have rounded, concave fins, whereas dace have upwardly curved fins. 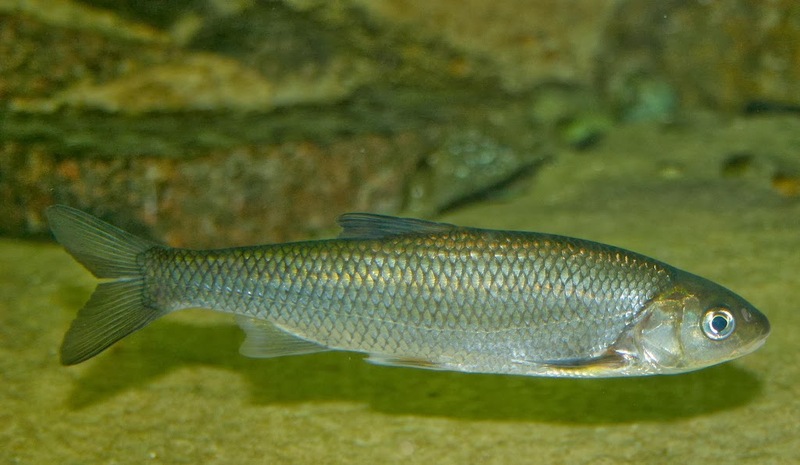 Juvenile chub are sociable, but adults are more solitary. They live to about fifteen years, females longer than males. Chub eat aquatic insect larvae, plant matter, small fish, snails, shrimp, crayfish and insects. Larger chub predominantly eat other fish. Chub spawn when the temperature exceeds 12°C. 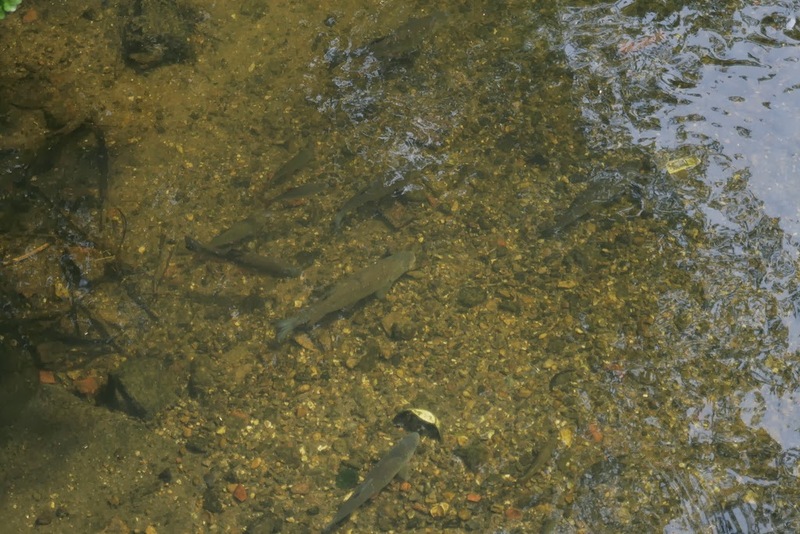 Spawning happens in late spring or summer. Males reproduce for the first time at two to four years, females at four to six years depending on environmental factors. The males assemble at the spawning grounds and chase females to shallow riffles, an activity that is often accompanied with much splashing about! Females spawn with several males. Females distribute their sticky eggs in fast-flowing water above gravel, or (more rarely) among vegetation. Males then pass over to fertilize them. Chub larvae and juveniles inhabit very shallow shoreline habitats and focus their energy on feeding and growing. 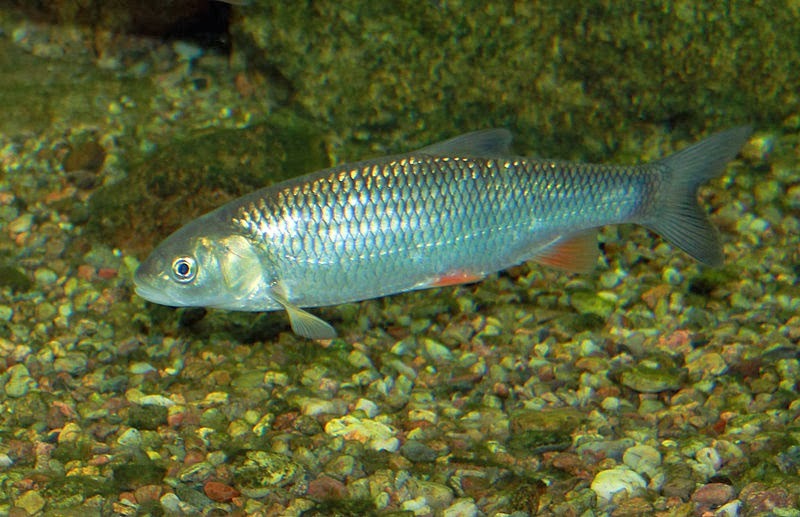 Chub can hybridise with some other species when breeding takes place in the same area. They can form fertile hybrids with bleak.